This page of WLAN 802.11ac tutorial covers 802.11ac MAC layer. 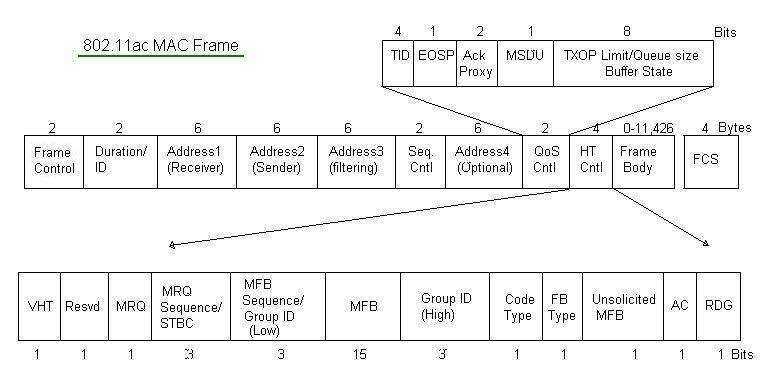 The 802.11ac MAC layer has similar frame format as earlier used in 802.11n but there are few changes as outlined below. • extension of maximum frame size to about 8K to 11K bytes. • Frame aggregation concept was added in 802.11n so that network efficiency can be increased. 11ac added new feature to this by allowing all frames to be transmitted should use A-MPDU format. Hence even though there is one frame that too needs to be transmitted in A-MPDU. • HT control field is kept same as 11n, when it begins with 0 it will be 11n frame, if it begins with 1 it will be VHT frame(i.e. 11ac frame). Data payload for aggregated frames consists of following. MSDU contains IP layer information. Max. length of A-MPDU is controlled by A-MPDU length exponent. Exp can range from 0 to 7, this yields A-MPDU to be of length 8KB to about 1MB. Following are some of the useful attributes of 11ac MAC layer. 802.11ac has VHT capabilities Information Element(IE) , which is the format used in management frame required to establish connection in 802.11ac networks. VHT operation Information Element in 802.11ac is used for operation of the 802.11 network. Basically it describes channel related information such as width, frequency and rates supported by the transmitter. Rates help in determining MCS and number of spatial streams. A-MPDU for transmit and receive, Clear Channel Assessment (CCA) on secondary channels and bandwidth signalling in RTS/CTS are mandatory features in 802.11ac WLAN network. There are few optional features which include single user beamforming and multiuser beamforming and GCMP. This tutorial also provide link to 802.11ac data rate, beamforming, frame format, physical layer, radio network planning, spectrum mask. Refer links mentioned on the left side panel.